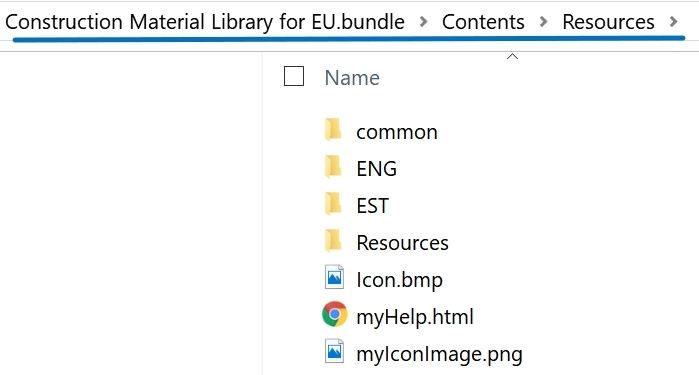 To install Construction Material Library, run downloaded *.msi file to extract the content (default path: C:\ProgramData\Autodesk\ApplicationPlugins\Construction Material Library for EU.bundle). 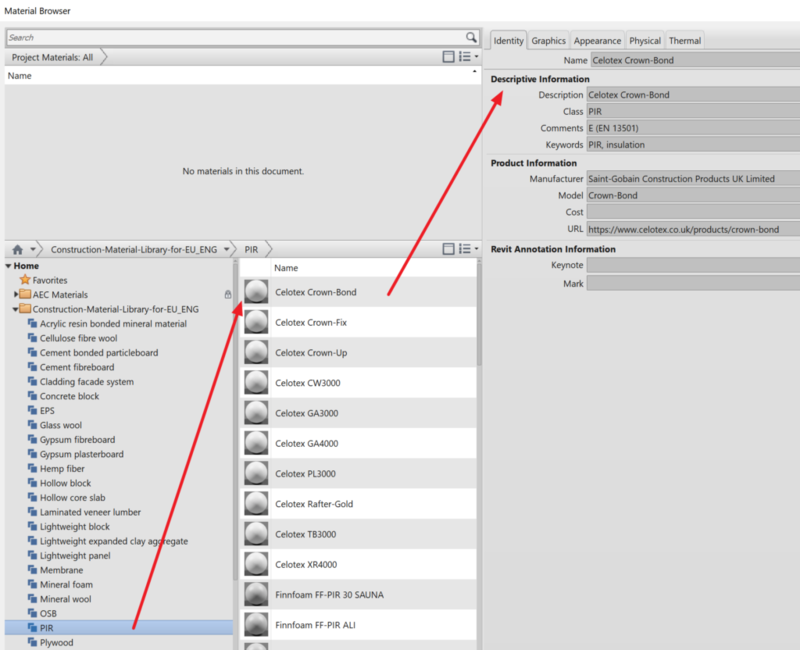 Installation does not affect any registry settings, you are adding additional content (library) pack. Note: As content is same in both languages, it is not needed to select both. The only difference is that material descriptions are in language you select, therefore it is easier to search some material. Otherwise those are equal. Also, in current version, Estonian version has a bit more description strings, meaning that you can carry out a bit deeper search. 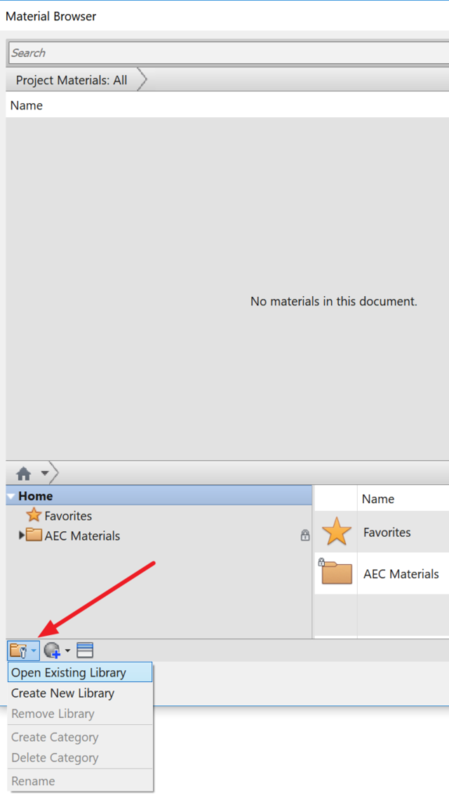 common / pics – some materials refer to texture files, therefore you need to point to this folder in a material definition. 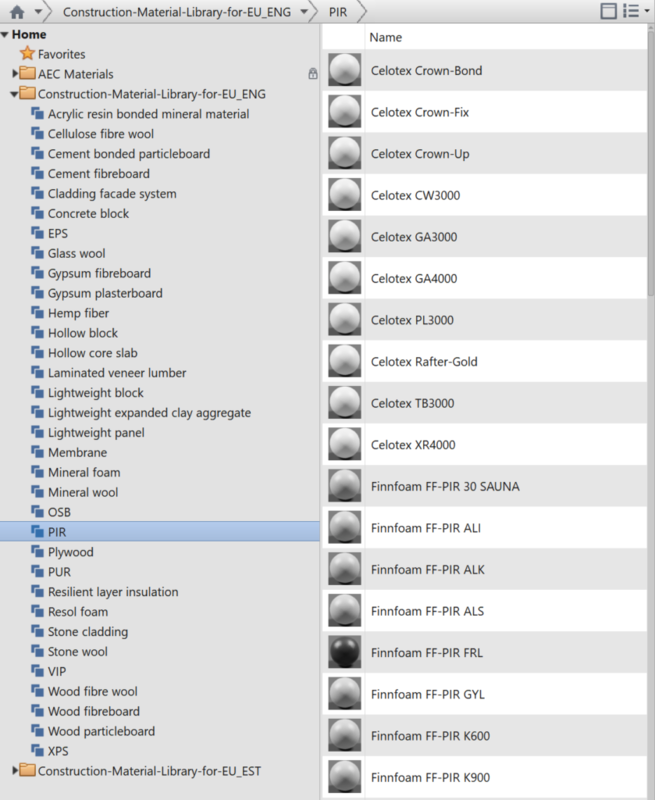 ENG / Construction-Material-Library-for-EU_ENG.adsklib – material library to be selected from Autodesk product (in our case we concentrate onto a Autodesk Revit). All main descriptions in English. 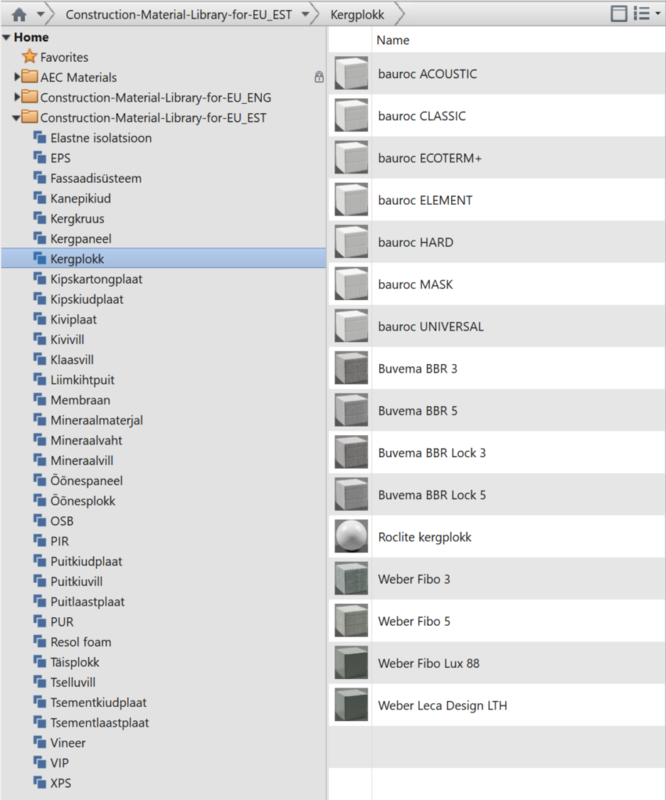 EST / Construction-Material-Library-for-EU_ESTadsklib – material library to be selected from Autodesk product (in our case we concentrate onto a Autodesk Revit). All main descriptions in Estonian. common / License_EU_ENG.txt – license info that was shown during the installation. Read it carefully. Create a new project or use some current one. To understand the workflows about this content, it is easier, if no other materials are defined in the current project (template). Of course, you can combine library materials with other materials you have defined, but for current demo purpose, all default or other materials are deleted (therefore we call it as an empty project file). Run Autodesk Revit. Open a sample project. Open up Material Browser: Manage > Settings > Materials. Identity – material name, description values, also note that “Comments” currently include the “Reaction to fire” class based on EN 13501-1 (sometimes it refers to other standard). Graphics, Appearance – material texture or representative color is used (usually screen-crabbed from the manufacturer website, therefore not 100% true color tone). Physical – key physical parameters: density, available thickness options, with blocks also concrete compression – please note that those values are taken from manufacturer website that can change, therefore use with caution and always doublecheck. Thermal – key thermal parameters: thermal conductivity, density (same as in physical tab) – please note that those values are taken from manufacturer website that can change, therefore use with caution and always doublecheck. You can search specific material using Search box. Note that not all parameters are searchable. 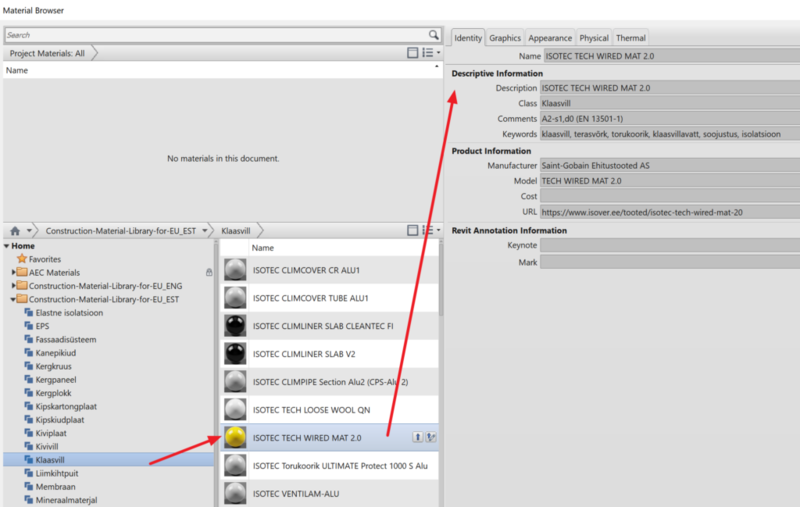 For example, if the material is in library and not in a project, less parameters/descriptions can be searched through). The library items are mainly sold in EU, or more specifically in the Nordics. Therefore some materials do have local names and no English version is available. Also note that so called global manufactures do produce materials under different names/parameters in different regions. Each material has the link to manufacturer website. By using that information, you can find more appropriate version or add missing materials to the list. If these key values were missing, the material was not added. Are you as a manufacturer interested that some material will be added in the future update? Let’s discuss, but please ensure that those parameters are openly available from the manufacturer website and material has so called its own subpage, from where anybody can double-check the information and ensure its validity.